I bought my first (not registered) Whippet in 1978, when my old Dachshund "Tips Søster" died. Then, in 1985, I bought my first pedigree Whippet, "Oldkins Cat O'Nine Tails", and since then we have always had at least 2 Whippets in the house. 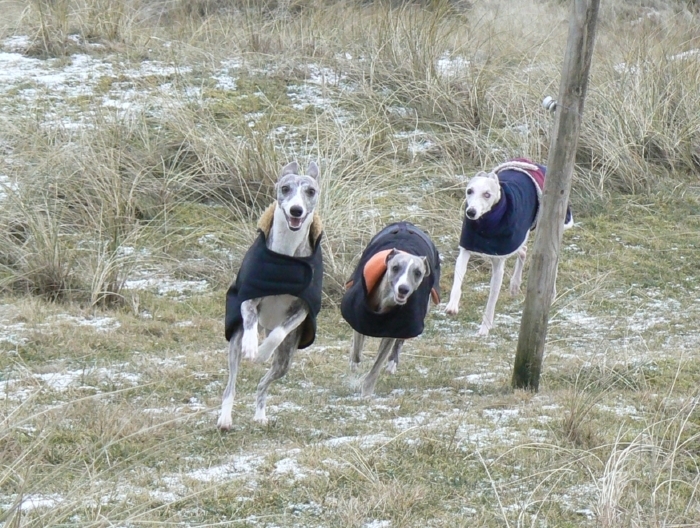 At the moment we have six Whippets at the age of one to 13 years. All our dogs live in the house, and are primarily much loved members of the family, and every day we take all our dogs to the beach or the dunes for a good walk. Only occasionally we breed, and only when we want to keep a puppy or two for ourselves. We strive to produce puppies of high quality and excellent temperament.